Sign up to help with Dorothy’s Cafe next week! Dorothy’s Cafe starts back up next week! Follow this link to sign up to help, or email us at gvillecw@yahoo.com for more information. GCADP EVENT AT THE GREEN HOUSE THIS SATURDAY: Gainesville Citizens for Alternatives to the Death Penalty (GCADP) invites you to meet Florida Death Row exonerees Herman Lindsey and Seth Penalver. This “meet and greet” social will be on Sat, Nov 2 from 7-9pm at the Gainesville Catholic Worker House. Refreshments provided by GCADP. Seth Penalver and Herman Lindsey were wrongfully convicted and sentenced to death and spent 18 and 3 years, respectively, on death row in Florida before proving their innocence and gaining release. They will give a brief talk, at 7:30 pm, sharing their stories. The rest of the evening will be an opportunity to meet them and share fellowship with them. They will also be speaking Sat, Nov 2, at 3:30 pm in the library at St Augustine’s Catholic Church and Student Center, 1738 W University Ave, and Sun, Nov 3 at 2:00 pm at Emmanuel Mennonite Meeting House, 1236 NW 18thAve. Each event will have a different primary speaker; the public is encourage to attend both. Call Miriam Elliott at 352-378-1690 for more information. MICROFARM MORNINGS: Each Thursday morning from 8-11:30 will be a workday at Black Acres Microfarm (BAM). Contact Jade Allen via email (jadesallen@yahoo.com) or phone (352-337-0817) for questions &/or directions to BAM. ART-FOR-ALL: Saturdays from 2-5pm at the Green House, come help craft items for our upcoming open house and holiday sale. No experience is necessary and all materials are provided. Children are welcome. This week’s project is recycled paper earrings and paper cranes. [Dorothy] Day had spent the first thirty years of her life in an internal battle between an intense drawing to Christian faith (specifically, Roman Catholicism) and an equally strong, deeply personal identification with the sufferings of the poor and the struggles of working men and women under capitalism. Until she met [Peter] Maurin, she saw no way to bring these two things together…Then, after an agonized prayer for guidance… Day found Maurin at her tenement door…Out of all [Peter’s] talk came a vision for what was to become the Catholic Worker movement, the answer to Day’s prayer. VOLUNTEERS NEEDED! We need more volunteers for pretty much everything we have going at the Green House right now, particularly the Coffee Shops and the Microfarm workdays. Also, if we are to restart Dorothy’s Café next month as we hope, we need some commitments for regular volunteers (Wednesdays—preparation from 9:30-12, serving and clean-up from 12-3). Please contact us at gvillecw@yahoo.com for more information, or to let us know if you can make a regular (or irregular) volunteer commitment to any of our projects. ART-FOR-ALL: Saturdays from 2-5pm at the Green House, come help craft items for our upcoming open house and holiday sale. No experience is necessary and all materials are provided. Children are welcome. This week’s project is cinnamon and bread dough ornaments. THANK YOU! Thank you so much to all those who have recently sent in financial gifts to the house! We greatly appreciate your generosity, which has made it possible for GCW to stay afloat for the time being. For those able to make a regular commitment for the future so we know what we can count on, we appreciate it, but one-time gifts are very welcome as well—every little bit helps! The message of the gospel is meant for all people and the beliefs and values of the Catholic Worker were never meant to begin and end at the walls of an “official” House of Hospitality… As Christians, we are all called to perform the Corporal and Spiritual Works of Mercy at a personal cost. We are all called to be peacemakers. We are all called to live lives of voluntary poverty. We are all called to build a new world within the shell of the old and to serve God by serving the common good. Last June, our West Virginian volunteer, Oliver Crawford, made a long term dream come true. He built a free little library for our parking lot oasis! 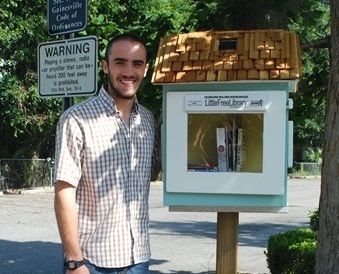 Little Free Libraries are a place neighbors can share their favorite literature and stories. As the sign says, “Take a book, leave a book.” What a nice way to connect people over a good book! And it’s just perfect with the beautiful painted park bench (thanks to Mary Peer, and Gloria and Clayton Grady-Schmidt) and Maggi’s lovely butterfly flower donation. Do you have a favorite book you would like to donate? If so, just drop it by the Green House between 6:30-8pm on Sunday, Monday, or Thursday evenings, or anytime we are open for an event (see our schedule for this week). We have bookplates for you to fill out with your first name and a sentence or two about why you liked the book. Or you can download your own here. Also, we may have the only solar-powered library in the country. Oliver installed a solar panel on the roof which lights up the library for a few hours after dark! Oliver with the Free Little Library he built–Thank you, Oliver! Microfarm Workday and Art for All Today! We are pleased to say that our first week of re-opening the Green House has been going really well so far! Just a quick reminder that our Microfarm workday is TODAY Saturday, October 5. Contact Jade Allen via email (jadesallen@yahoo.com) or phone (352-337-0817) for questions &/or directions to BAM. Also, the Art for All crew has decided to meet TODAY, Saturday, Oct. 5 as well. If interested, join them at the Green House at 2pm. Children are welcome! Finally, we will post a fuller update on the activities of the past week and those coming up this next week tomorrow, but for now just fyi the breakfasts were so successful this past week that we have decided to add breakfast on Monday, in addition to Tuesday and Friday. Thanks to all who have been helping with that!